Our push-to-lock loop screws function just like our plastic screw posts, but these have an open loop on the screw head. The posts and screws grip and hold simply by being pushed together; threading is not required. Loop screws can be used to make swatch books, for foam board signage, or to connect to a display. 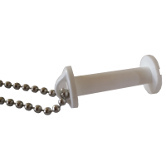 Use them with bead chain, monofilament line, cord, or wire hooks to attach them to anything.